Graham Goddard was born in 1956 in Woodstock, Cape Town. His parents were factory workers in the Woodstock/Salt River area. Goddard lived most of his life on the Cape Flats, in Wetton, Wynberg and, Belthorn. In 1980 his family moved to Mitchell’s Plain where he currently lives. He became interested in photography around 1979 but only purchased his first camera in 1981 with money earned while working for a small engineering survey company. In 1982 Goddard enrolled in part time photographic classes at the Ruth Prowse Art School, in Woodstock. From 1985 to 1987, he worked as a freelancer photographing mainly social events (weddings and parties etc) whilst working on some personal photographic projects. The production of black and white photographic images interested him. It was through an advertisement, in 1986, in the local community newspaper, The Plainsman, calling on artists, writers etc. 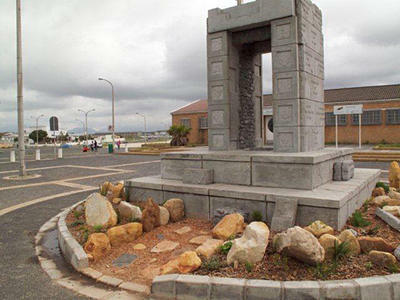 to join the Mitchell’s Plain Arts Group, that he met the artists Tyrone Appolis and Martin Stevens. Around early 1987, Stevens and Appolis invited him to a meeting of some South African photographers. This meeting was to discuss photographic works to be exhibited at the Culture in Another South Africa (CASA) Festival in the Netherlands. It was at this meeting that he met Omar Badsha, Rashid Lombard and Jimmy Matthews. These were photographers that he had not met before but was familiar with their images and through Badsha’s books that he had purchased at the time: The Cordoned Heart and Imijondolo. A few days later he joined involved with Afrapix when Omar Badsha asked him to print some black and white photographs for him. The first photographic exhibitionthat heI printed for Afrapix was Beyond The Barricades which included prints for the CASA exhibition in the Netherlands. His association with Afrapix was as a photographic printer of black and white exhibition prints. Goddard is presently working for the University of the Western Cape’s Robben Island Mayibuye Archives. He is presently working with digital photography. Namibia Exhibition, for John Liebenberg (Exhibited at the Market Gallery, Johannesburg) Paul Weinberg’s Namaqualand Exhibition. Arts Festival in Grahamstown; also exhibited at the Africa '95 Festival in Birmingham, England) featuring the works of 8 South African photographers: Eli Weinberg; Leon Levson; Willie De Klerk; Bob Gosani; Ernest Cole and Ranjith Kally. Kaapse Vlakte - Through The Lens photographic exhibition for Southern Images Photographic Agency. Part Of The One City Many Cultures Festival. Western Cape Teachers Union (WECTU): Afrapix workshop. Cape Media Training Course: Presented a photographic training component for one of their courses. Alexander Sinton High School: Photographic workshop for Matric art students (1991). Rosmead High School: Pinhole photographic workshop for Matric art students at the Battswood Art Centre. Eye Africa Exhibition: Presented a photographic workshop as part of the education component of Revue Noire Eye Africa Exhibition: African Photography 1840 – 1998. History Dept, University Of The Western Cape, Practical photographic component of the Visual History course presented by Drs. Patricia Hayes and Gary Minkley. As well as a number of black and white photography courses presented to various individuals. Arts Festival, Baxter Theatre, Cape Town, Photographic exhibition curated by photographers Rashid Lombard and Gavin Pieterse. South African Democratic Teachers Union, Western Cape Branch, Exhibition for their AGM, Cape Town. Picturing Our World, South African National Gallery’s (Iziko) exhibition for the Grahamstown Standard Bank National Arts Festival. Picture Freedom, Exhibition and auction of photographs for South Africa’s Voter Education London, UK. A Shifting Landscape, Photo International; Rotterdam, Netherlands. Barricaded Rainbow, A Group Exhibition; Centre for African Studies, University of Cape Town. Ekhaya Travelling Art, A Group Exhibition curated by Cape Town Artist, Hamilton Budaza. Contact Sheets: History and UWC, An Exhibition In Progress. Curated by Dr. Patricia Hayes and Farzanah Badsha. Jol, Iziko South African Gallery, Curated by Pam Warne. Goddard has photographic works in the South African National Collection at Iziko South African NationalGallery in Cape Town and in the Nederlands Fotomuseum in Rotterdam, Holland.